1961’s Babes in Toyland had a lot going for it, and still does, for fans of Disney films. Regular Disney actors and actresses, including Annette Funicello, Ed Wynn (Mad Hatter), Gene Sheldon and Henry Calvin (Zorro’s Bernardo and Sergeant Garcia), gave this movie a life and more than a handful of memorable songs. As it turns out, however, the most enduring figure from this feature is the Toy Soldier. 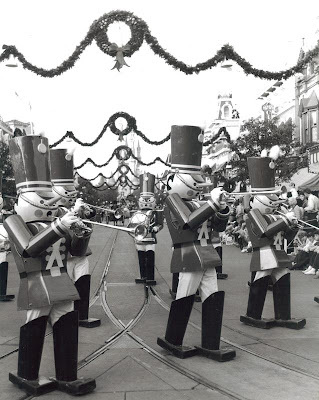 These stiff red, white and gold trimmed military men have become an integral part of the holidays, appearing in various forms and fashions throughout the years, including the Walt Disney World Very Merry Christmas Parade. Here they are tooting their own horns from the 1984 version of the parade.